Stephen Bartholomew Photography | Dear Diary 15th September: The “But someone has to do it Tour” "Looking Back"
Dear Diary 15th September - “But Someone Has To Do It Tour”. Burghley to Blair, my daily diary of two weeks of top end equestrian sport from behind the lens. Looking Back. The road trip came to a close after 12 days away and some 1170 miles covered. We [Photographers Julie Priestley and Libby Law] left Blair about 7:00 to get caught in traffic leaving the event - very slow going on the A9 to Perth. Stopped for fuel in a service station south of Glasgow on a pump next to Pippa Funnell’s lorry. She told us about an accident that had blocked the motorway and a possible re-route which saved us many hours. The amount of diesel that was pumped into her Oakley would keep my VW going for six months - I hope she is on BE expenses. I can’t think of many top sporting stars when after winning a medal would be doing the driving home. We got back to Oakham about 3:00 a.m. stayed overnight and went our separate ways after breakfast. Julie and Libby are both off to Blenheim this weekend, I hope the weather turns for the better. Blair was the last of the major equestrian events for me this season other than Littleton Manor Horse Trials 10th & 11th. My planned sports shooting calendar for the rest of the year is a bit of a mixed bag, Lawnmower Racing World Championships, NFL at Wembley, Barclays ATP Tour at the O2, London Lions Basketball and of course the William Hill World Darts Championship at the Alley Pally. Over the two weeks there were a number of highlights and as ever a number of things in hindsight I would do differently. I need to work harder on my dressage images, working with a rider or attending a couple of events to practice would help. My Cross Country planning improved and I got most of the shots I had envisaged despite the weather. So all in all a good two weeks. If you see me at Littleton Manor Horse Trials 10th & 11th please say hello. 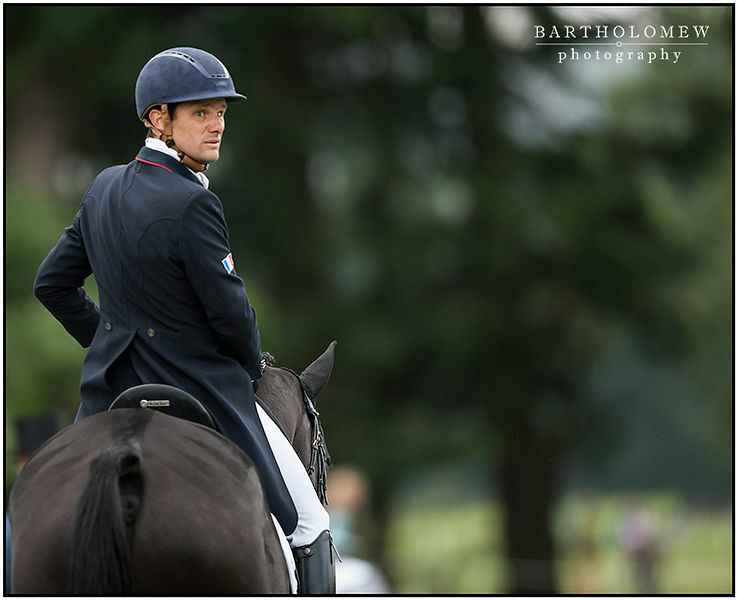 Picture - Nicolas Touzaint [FRA] riding Radijague leave the area after their dressage test. 11th September 2015, Blair Atholl, Scotland. Nicolas Touzaint [FRA] riding Radijague leaves the arena after their dressage test on the second day. The Longines FEI European Eventing Championships 2015 Blair Castle.